May 29, 2016 – The Utah Department of Transportation (UDOT) is planning to remove bike lanes on Redwood Road between 10440 S to 12600 South in the Salt Lake Valley. UDOT is proposing to restripe Redwood Road from 5 lanes to 7 lanes from 9000 South to 12600 South. Additionally, a separate project is in place for the section from 12600 South to Bangerter Highway which would be widened to 5 lanes. The bicycle lanes and parking would be removed from10440 S to 12600 South. The section from 12600 South to Bangerter would get bicycle lanes as part of the second project. 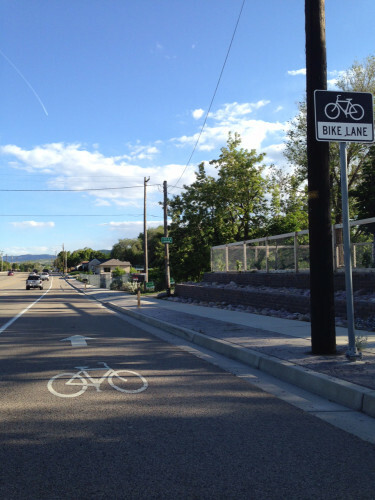 Redwood Road is on the Wasatch Front Bicycle Plan as part of the shared regional bicycle priority network. In a statement on the Wasatch Front Regional Council's website, UDOT is seeking to amend the WFRC 2015-2040 regional transportation plan. While the amendment must be approved by WFRC, UDOT is making the request to remove the bike lanes. Why is UDOT making this request? It's not clear from their proposal, however increasing space for more cars is the most likely reason. UDOT states that they are widening the section from 12600 to Bangerter to meet current and future traffic needs, so it's likely that they are removing bike lanes and widening Redwood between 10440 S and 12600 S to also increase vehicle capacity. This request consists of multiple projects within the RTP along Redwood Road. The following changes are being proposed: (1) Moving an “Operational Project” from Phase 2 to Phase 1 between 9000 South and 11400 South and (2) Moving a widening project from 5 to 7 lanes from Phase 3 to Phase 1 between 9000 South and Bangerter Highway. There is a funded Phase 1 widening project from 3 to 5 lanes between 12600 South and Bangerter Highway with right-of-way being purchased and pavement being constructed to accommodate a 7 lane cross-section at a cost of approximately $38 million. The additional lanes from 9000 South to 12600 South would be added not through additional pavement, but through restriping, at an additional cost of $2.3 million which has been secured by UDOT. The total project cost is estimated to be $41 million. Note that this proposed amendment has several significant issues that are being discussed with UDOT and the local governments in the area regarding the following: (1) Removal of three miles of existing striped bicycle lanes on the shared regional bicycle priority network from the South Jordan Parkway to 12600 South, (2) Removal of on-street parking from the South Jordan Parkway to 12600 South, and (3) Addressing impacts on transit improvements and planned land uses along the entire corridor. Redwood Road is identified as part of the WFRC's priority bike route network. Removing bike lanes from 10440 S to 12600 S would cut out an important connection from the system, and force cyclists to ride in heavy traffic to reach destinations on Redwood Road and surrounding neighborhoods, or ride west to 2700 W or east to 1300 W to continue to travel north or south. Either option would force cyclists to go many blocks out of their way. Comments should refer to Amendment Number 2 to the current 2015-2040 Regional Transportation Plan (RTP). Removing bike lanes on Redwood Road is simply not an acceptable course of action for transportation planning in Salt Lake County. Bike lanes increase ridership, improve air quality, and increase the health of the citizens of Salt Lake County. More vehicle travel lanes, however, lead to more traffic and more congestion. Widening Redwood, and adding more traffic lanes is not likely to help with traffic congestion. Increased vehicle lanes results in increased vehicles, and ultimately does little or nothing to improve congestion. What is needed is increased investment in transit, bike lanes, and pedestrian accommodations. Redwood Road, in particular, is a crucial north-south connector for the entire Salt Lake Valley. The corridor runs from Utah County to Davis County, and rather than removing bike lanes in the heart of the corridor, great effort should be made to add bike lanes along the entire stretch. In the last year, UDOT has worked with Salt Lake City to add bike lanes in the region around 2100 South to North Temple. 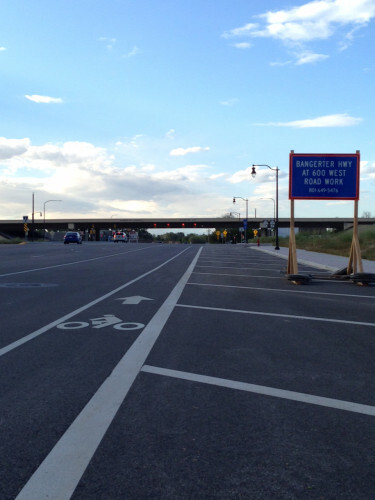 Bike lanes are going in from 12600 S to Bangerter. Bike lanes exist south of Bangerter. Removing lanes in this section is counterproductive to creating a complete transportation network. It is also contrary to the goal of the regional bicycle network. Removing bicycle lanes will result in more injuries or deaths to people on bikes, worse air quality, and more vehicle miles traveled, and hence worse air pollution. Removing these lanes will force cyclists to travel to 2700 W or 1300 W to continue north or south through this region. I would point out that maybe the car traffic should be required to go this far out of the way to complete their trips rather than the people on bikes. People will likely continue to ride on Redwood even if the bike lanes are removed since their destinations are no doubt on or near Redwood. Removing the bike lanes will just result in a safety hazard for people on bikes. Cycling Utah recommends that the amendment to the Regional Transportation Plan not be approved.